An eclectic compilation of vocal pieces that reflect a contemplative look at life in the Armenian Diaspora. WOODSIDE, N.Y. - The Armenian Center in Woodside, N.Y. recently served as a venue for four female writers of the diaspora who presented their works at “Kuragan Koharner yev Kini” (Literary Gems and Wine), a program sponsored by the New York Chapter of the Hamazkayin Cultural Association. 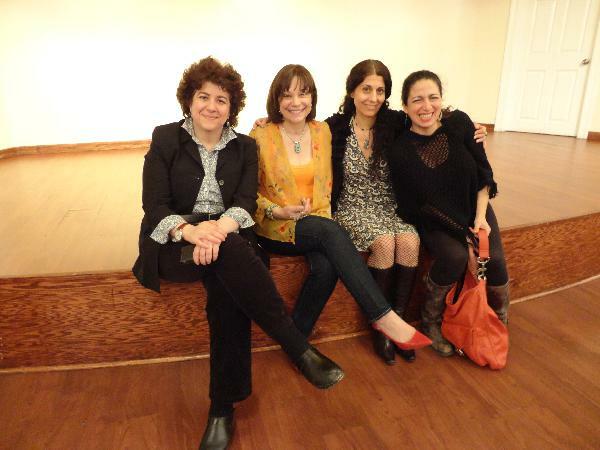 Actress and storyteller Nora Armani, writer and political cartoonist Lucine Kasbarian, poet and artist Lola Koundakjian, and writer and editor Aida Zilelian-Silak shared writings that explored the complexities of the human condition. The collective result was an eclectic compilation of vocal pieces that reflected a moving, contemplative look at life in the Armenian diaspora. Creator, director and actor in the play, "Sojourn at Ararat," Armani is performing in "Golden Boy," a pilot program for CBS Television. A long-time publicist for the book publishing industry, Kasbarian has written publications about Armenia and the Diaspora for young audiences. Creator and Director of the Armenian Poetry Project, Koundakjian also founded and runs the Dead Armenian Poets Society. New York writer and editor Zilelian is the founder and director of Boundless Tales, a reading series of poetry and prose in New York. In her introduction, program organizer, rare book librarian and literary devotée Arevik Caprielian expressed her satisfaction in showcasing accomplished Armenian "creatives." "These writers need not be heralded beyond the Armenian milieu in order to be recognized as credits to the global Armenian nation," she said. "While Hamazkayin remains true to its mission of preserving and disseminating Armenian traditional literature and arts, it also moves forward with the times and inevitable changes in diaspora," she continued. "Therefore, it embraces contemporary authors writing in various languages, considering them contributors to the body of Armenian literature." Caprielian concluded by affirming, "A nation maintains its distinction through arts and literature." Following are English-language excerpts from their readings of poetry and/or prose. Once more an exile, an exile for all living memory. forms an integral part my being... other. No civil wars, deportation, forceful displacements for me. This innate property is my dowry at birth. I am a native exile. “Ultimately, my aim was to refresh Hairig's supply [of our ancestral elixir], and from a source logistically close to Dikranagerd. Doing so seemed a meaningful thing a grateful child could do for a devoted parent in his twilight years. My father had never seen the home of his ancestors and, yet, he carried the ham yev hod (flavors and fragrances) of Dikranagerd in his words, thoughts and deeds-from his modesty, humor and hospitality, to his dialect and storytelling ability, to his culinary and musical aptitudes. A humble gift would be to help him make that remarkable elixir that could, at least emotionally, bring his ancestors, their way of life, and our lost homeland back to him. And was it not worth it to rediscover a missing and precious part of our culinary heritage, and perhaps share it with the world? Breathing deeply, and then tired. The past is getting dimmer. Who was I thinking about a few minutes ago? The weather seems to help me remember. Was it raining on that day? Yes, there was an umbrella with you. And I was wearing an anorak. And my chin was wet - I remember. And I cross the street for the meeting. And soon the rain stopped. There was a smile on your face. You're with your umbrella and I am wearing my anorak. An excerpt from Aida Zilelian's "He's the One For Her," a short story about a young Armenian-American woman seeking a handsome, Armenian-speaking mate, and published in Ararat. “The boys from the small town in Massachusetts where she had been raised were ultimately disappointing to her in a variety of ways. Some wanted more than she was willing to offer, and at the end of these dates (the last one was her father's co-worker's son Hovsep) she found herself in the passenger seat of a car clutching the collar of her shirt to keep it closed, or yanking down her skirt to keep it in place, eventually weakening her date's advances. Other young men, she realized, did not have any interest in attending Sunday Church mass, and spoke Armenian so poorly that she winced at their feeble attempts at conversing with her. From left: Lola Koundakjian, Nora Armani, Lucine Kasbarian and Aida Zilelian-Silak.